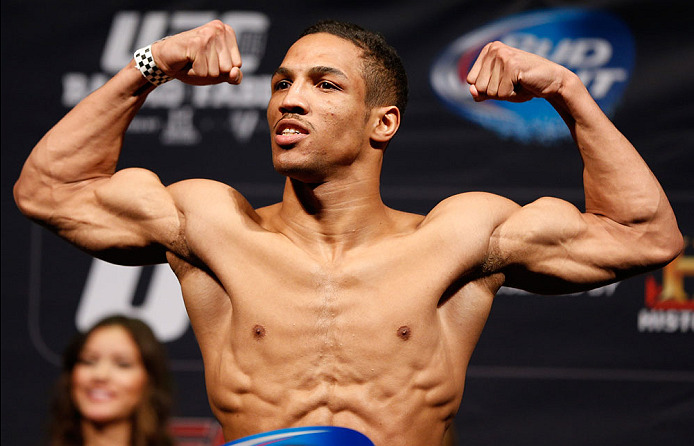 Kevin Lee kept his promise. Growing up in one of the roughest areas in Detroit, it would be almost too easy to say there was no joy on Joy Road. But Lee wasn’t about to get swept up by the streets that had taken so many lives on that block. He was determined to not follow the wrong path though, something that sounds easy to someone, but that in reality couldn’t be much more difficult, especially when you are surrounded by negative influences and in so many cases, desperation. College was a way out for Lee, and with college came wrestling. But in 2011, mixed martial arts entered the picture, and the young man who was dubbed “The Motown Phenom” had a new path out of the Motor City. Nearly three years after his first amateur fight, Lee is in the UFC, and while he didn’t win his first bout against Al Iaquinta at UFC 169 in February, he did get a few bucks in his pocket for his efforts, and with it, he kept a promise he made to a couple of very important people. He’s being modest. Because you can’t put a price tag on what the 21-year-old did when he moved out to Las Vegas after the Iaquinta fight and brought his parents with him. You can read those words and know that Lee is a lot more mature than most of his peers, but hearing him say them gets that point across even more. He’s seen a lot in a short time, but he’s risen above his environment to chase a dream, and what’s more inspiring than that? And he’s just getting started. 7-0 on the local circuit when he got the call to the UFC, he lost a close decision to Iaquinta in New Jersey, but in the process impressed anyone who saw the fight, with the exception of the fighter himself. He gets a second shot this weekend against Canada’s Ronson, and with a full camp in Vegas training with the likes of Dewey Cooper, Robert Drysdale, and Robert Follis, along with input from his longtime coach Sean Dizay, he’s excited for the chance to really show what he can do in the Octagon, not just on Sunday, but in the years to come. And if all else fails, he’s still got Detroit toughness to call on, and that’s a trait that will never fade.